On a weekly basis, I encounter parents who tell me about video game addiction or some form of screen addiction in their home. This is an attachment issue. Whether it's a small or large homeschooling family, or a family who has put their children into public or private education - this is a dilemma facing all families. 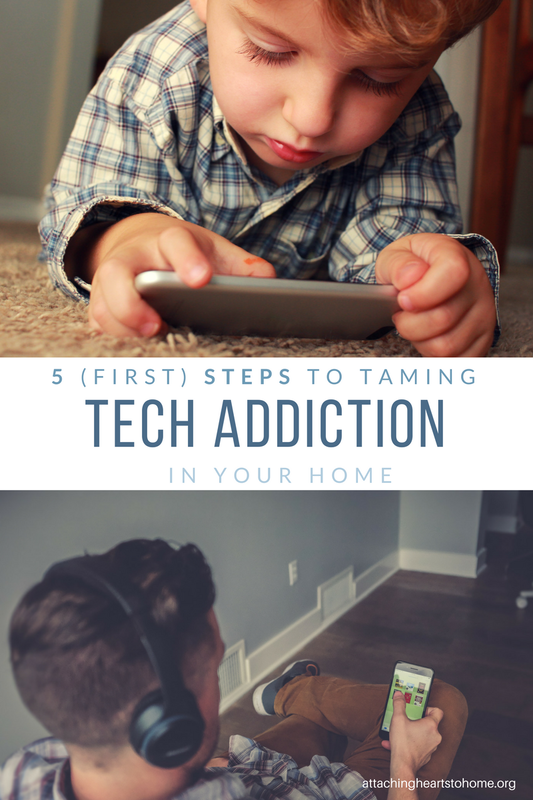 There's no easy fix, but today I want to give you five first steps to take to overcoming screen addiction in your home and how to re-establish connection and family attachment. Sometimes it is a parent (or both parents) struggling with tech addiction. They've come to recognize that texting each other from one room to the next rather than having a face to face conversation has become the norm in their household. One wife told me recently that, "We've just had one too many nights where one of us is up watching a movie or on our screen, while the other person goes to bed alone." These are not healthy habits for a productive marriage and over time it wears down the bonds of attachment. Often times it is a child thus afflicted. What started off as "educational time" on an ipad or smart device has now turned into a constant tug-o-war and insistent asking of, "Can I play my game now?" And it’s not just homeschool families that use the “educational time” idea. Parents have also reported to me that sibling fights have increased while playing outside, building forts or playing at the park have decreased.This broken attachment reality exists in far too many homes, with the problem growing daily, all over the world. Studies are showing that screen addiction can greatly hinder the brain’s frontal cortex — which controls executive functioning, including impulse control — in exactly the same way that high potency drugs, like cocaine, does. Which is why kids and parents alike are getting locked into the tech trance known as screen addiction. This is how unhealthy attachment is formed. Often in my presentation for groups on the topic of screen addiction, I am asked for strategies to help homeschooling and non-homeschooling families overcome this addiction. Let me offer today, some of the “helps” that can begin the addicted person to freedom. 1. Acknowledge the addiction, pray for help, and choose someone reliable to whom you will be accountable. Create a plan of action and report in often to your helper. Talk with them when you are tempted to turn to your screen addiction. This sounds simple enough, but vulnerability doesn’t always come easy. Take this step knowing that you are correcting your attachments and placing the on relationship with God and people rather than screens. If you are uncertain of what Screen Addiction symptoms look like, please read my earlier post on 9 Must Know Symptoms of Tech Addiction. 2. Begin weaning – taking specific times to make a digital Sabbath. This means setting blocks of time aside, with great intentionality, where you rest from screen time. This is to establish a new attachment and break the attachment to screen time. Just like a Sunday, where you refrain from work, take time to refrain from devices. At the beginning, the addicted person might only manage small rest breaks, but over time, these periods away from tech. are extended. A helpful way to do a digital Sabbath is to plan to physically be away from your devices. Now's the time to hop in the car and go on a relaxing drive or plan a day in nature. Put your hands to work with a project or serve a person in need. 3. Replace screen time with something productive (like doing a craft or baking), choose to be interactive with people (like playing a board game or going on a nature walk), or growth facilitating (like reading a good book or learning a new skill). Take time to explore and discover a new hobby. This may take some trial and error. But use that as a jumping off point to re-engage your sense of adventure with the world outside you and your home. Remember, it is the simple things that help build attachment. 4. Shut sound features off on your email, Facebook, texts, etc. Most apps have been designed to make you want to keep using them. They are designed with push notifications that continually announce themselves as urgent and intrude on your day. Shut the notifications off. Then, establish very specific times you will check communications and never more often. Over time, reduce the number checking times. Not sure how much time you really spend online? Use Rescue Time to discover how much time you spend on watching movies, posting on Facebook, surfing the web and any other type of online activities. Guaranteed to surprise you! 5. Create an “all off” time in the evening. Never go to bed with a device on during sleeping hours. Slow down and engage in calm activities. Sleep experts say that removing your device from your bedroom can significantly increase your rest at night. It is often too tempting to "check one more thing" when your phone is next to your bed. Keep a screen diary – At first, this can sound tedious, but writing in a diary every time devices are used brings awareness to HOW MUCH you are using your device. It also allows you to track progress and use the diary as a motivator. Everyone needs to see self-change. It is important that the addicted individual become educated regarding screen addiction and how it negatively impacts life, the brain, our time with God, and relationships. Attachment can easily become wrong ordered when we are under the influence of addiction. Understanding the root of addiction and being presented with practical evidence of damage is of great value to the struggling addict. Having a loving and supportive individual to walk side-by-side with the parent or child, gives hope and better probability of success. Nobody need stay stuck in a difficult situation. There is always a way out, with help. I offer mine.